I will pick on NJ since I grew up there. Most of Sandy's destruction was to homes that were built on what was Swamps, Marshes, and just open Bays and Water Ways when I grew up. They took waterways and back filled them for YRS and created entire developments of thousands of houses! Then mother nature takes her land back and it's a catastrophe! NO it towns seeing Local Tax money is all. Well do ya know where the Federal tax money comes from? Areas I used to fish and crab at are now Uber High End Developments that get wiped out during every Major or not so Major storm. Sorry but my taxes shouldn't subsides homes of Millionaires! As someone who lives here...you are absolutely right. Union Beach, NJ (No, Thank God I don't live in UB.) is a perfect example. 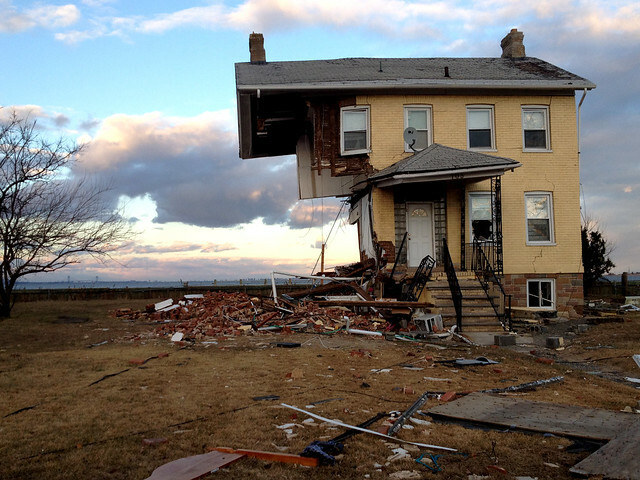 Recall that picture that made the rounds where half the house was standing. That was in UB which was or is a swamp even when it isn't raining. Looks like Trenton on a good day. So who all on the forum is in Florence's path? We need to keep tabs on you all over the coming days/weeks. Your government, ahead of the curve. Someone needs to go back to LNF. Damn that Trump. Why isn't he handling the weather better? Get ready for the claims that Trump causes cancer and all other forms of human misery. The left are clinically insane...and they want to lead our nation. You have to wonder why older Democrats subscribe to the nonsense that the seemingly younger part of their party engages in. I know there are older radicals as well but I'm referring to the family man with kids who hears and sees the bizarre things that they do and say...and yet votes for a Dem simply because they are a Dem. I work for a Black couple who owns the business. Very educated and have done well in life but are Democrat through and through. It is an Income Tax Preparation company so they can see how Trump has changed the tax structure. It does not make any difference to them. It just really boggles my mind.